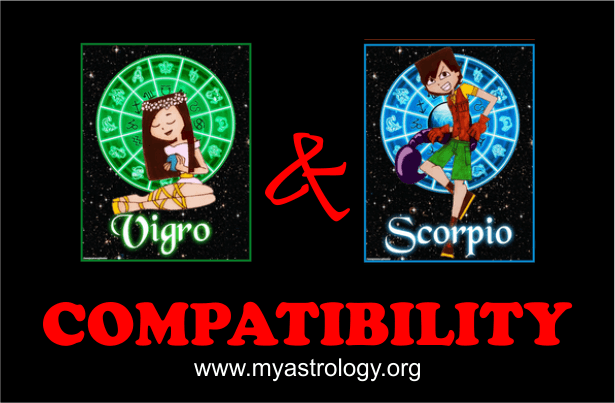 A relationship between a Virgo and a Scorpio is a combination of star signs that are two apart in the Zodiac. Virgo and Scorpio understand each other well, and converse well with each other. They share a strong, faithful bond with each other. The two signs prefer to spend time with each other, rather than with a lot of friends. Virgo and Scorpio are after fame and fortune. Both signs want worldly possessions and social status. They are both reliable, inclined to service, and helpful to their friends. Virgo are quiet and reticent, and Scorpio are more obscure. Because of their differences, both signs need to make compromises to each other. The ruling planet of Virgo is Mercury, and the ruling planets of Scorpio are Mars and Jupiter. Mercury represents communication and perception, and Mars represents passion; they go well together. The influence of Pluto adds depth to the relationship between Virgo and Scorpio. Scorpio are deep and passionate, and Virgo like this passion. Scorpio like the commitment and logical mind of Virgo. Virgo is an earth sign, and Scorpio is a water sign. Scorpio are profound in character, and could react violently to situations. They keep drawing back to themselves, but eventually burst out in fits of passion. Virgo and Scorpio want safety and steadiness, and this mutual want forms a devoted friendship between them. Virgo are plain and honest, and open up to others. Scorpio are deep and reserved, and attentive to concealed emotions and desires. Their relationship could get even stronger, if Virgo could realise this depth in Scorpio and understand the hidden meaning of their words and actions. Virgo could instruct Scorpio that outward appearances are not always significant. Virgo love Scorpio’s devotion, and Scorpio love Virgo’s rationality. Virgo is a mutable sign, and Scorpio is a fixed sign. Once they have established their aims and objectives, Virgo and Scorpio would stop at nothing to attain them. If conflicts occur in their relationship, the virgin is more likely to make compromises and keep the peace. The adamant nature of the scorpion often causes the virgin to give in. The partners need to communicate freely and discuss their mutual interests and desires. However, they usually maintain an amiable bond, and arguments are very rare in the relationship. The most remarkable aspect of a partnership between a Virgo and a Scorpio is their ability to work as a team, once a strong bond is formed between them. Scorpio love Virgo’s practicality and balancing nature, and consider them a true benefit to their friendship. The combined resolution and strength of Virgo and Scorpio make them an efficient pair.